A collection of images tying the history of Old Main to its relatively young namesake now graces the interior of Sam Houston State University’s newest dining facility. Old Main Market, named for the towering gothic structure on campus that was built nearby in 1890 and destroyed by fire in 1982, is a modern building designed for state-of-the-art culinary presentations. The challenge, according to SHSU Associate Vice President for Marketing and Communications Kris Ruiz, was to bring together two architectural styles that were vastly different. “Marketing and Communications worked with the university’s archivist Barbara Kievet-Mason, Kaiser Graphics, SHSU’s facilities management, and Aramark to bring the history of the original Old Main building to the dining facility,” she said. The solution was to exhibit historic images and artifacts in a contemporary fashion. At the beginning of the fall semester, a series of photographs was placed on 4-by-8-foot panels mounted on a cable-and-pulley system creating a 17-foot tall mosaic. 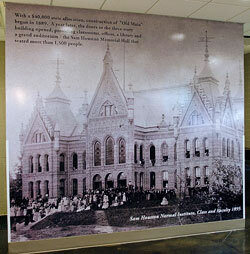 Across from the mosaic is a mural of Old Main and the class of 1895 reproduced on vinyl. “The mural covers a free-standing wall that hides a conveyor system,” Ruiz said. 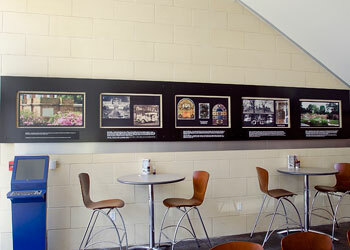 A historic display of images and artifacts containing actual shards from Old Main’s stained glass windows and decorative hardware is on the west side of the dining hall. A “bird’s eye view” photograph of the Old Main Memorial is located under the stairwell.